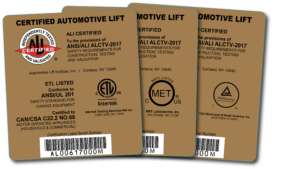 Lift models must be tested in accordance with the Program Procedural Guide and in accordance with the performance requirements of the American National Standard “Automotive Lifts – Safety Requirements for Construction, Testing, and Validation” ANSI/ALI ALCTV (current edition). All electrically operated vehicle lift models must be listed by a Nationally Recognized Testing Laboratory (NRTL),in accordance with ANSI/UL 201 entitled “American National Standard for Safety for Garage Equipment”; and for installation in Canada, in accordance with CAN/CSA C22.2 No. 68. The lift manufacturer’s authorized production facility must meet quality control requirements that are outlined in the Program Procedural Guide. This is verified by frequent surveillance and plant inspections.